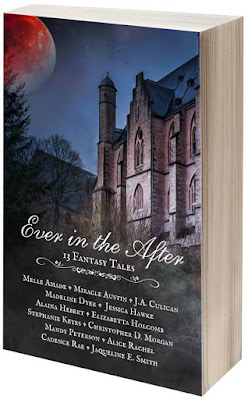 What is EVER IN THE AFTER? C. A title for an upcoming book? If you answered C, a title for an upcoming book, you are correct! EVER IN THE AFTER: 13 FANTASY TALES is a brand new fantasy anthology that will be released on April 1st, 2017! All proceeds from EVER IN THE AFTER will be donated to Lift 4 Autism as part of the Lift 2017 campaign. The authors selected to write for this anthology are Melle Amade, Miracle Austin, J.A. Culican, Madeline Dyer, Jessica Hawke, Alaina Hebert, Elizabetta Holcomb, Stephanie Keyes, Christopher D. Morgan, Mandy Peterson, Alice Rachel, Cadence Rae, and Jacqueline E. Smith. So please help us spread the word for this anthology far and wide!